TIJUANA, Mexico—Leaked US-Mexican government documents revealed both governments are maintaining a secret database targeting at least 59 journalists, activists, and an attorney as part of an intelligence-gathering mission under “Operation Secure Line,” based on their work reporting on and offering humanitarian aid to the recent caravans of migrants fleeing from violence and poverty. The National Lawyers Guild (NLG) condemns this practice as a blatant violation of civil liberties and attempt to intimidate those seeking to provide necessary, legal and legitimate aid to migrants and their families. An NLG delegation was in Tijuana investigating violations of migrants’ rights by US and Mexican authorities when the documents, titled “San Diego Sector Foreign Operations Branch: Migrant Caravan FY-2019, Suspected Organizers, Coordinators, Instigators and Media,” were uncovered. Prior to the leaked report, the delegation heard stories of hours-long interrogations, harassment, confiscation of electronic devices, and intimidation of activists and lawyers by immigration authorities on both sides of the border related to their humanitarian work, including members of the group Pueblo Sin Fronteras (PSF). Many activists who felt singled out by CBP correctly suspected that they were on a government watch list due to their association with the migrant caravan, especially following the of two journalists and US attorneys with Al Otro Lado who were denied entry into Mexico earlier this month, who were held and faced questioning for up to 10 hours. Alex Mensing, a US citizen living in Tijuana who helped coordinate the delegation’s meetings with domestic and international NGOs, as well as Mexican human rights and immigration authorities, chose not to accompany the delegation to San Diego on Wednesday for meetings with the ACLU, Border Angels, and the International Rescue Committee. Mensing has been repeatedly stopped for secondary questioning by US Customs and Border Patrol (CBP) on a clear effort to intimate PSF and other volunteers. “It’s worrisome, but not surprising,” Mensing told Telemundo yesterday. “I was taken into a concrete cell for interrogation and they took my phone, scanned all my notebooks, all the papers I brought… It angers me that the government is using taxpayer funds to create a database meant to intimidate people.” For the last four months, Mensing has attempted to obtain information directly from CBP about his repeated questioning to no avail. It is also important to note that Mexico has previously operationalized their surveillance of activists and journalists through practices such as Pegasus malware, and the leaked list also delegitimizes the Democrats’ offer of a “technological wall” as an acceptable compromise to Trump’s border wall that would be any more lawful or based in human rights principles. While government surveillance of activists is nothing new, and an issue the NLG has a long history of fighting, we are particularly concerned that binational surveillance of activists will not only deter people from engaging in humanitarian action but will also leave migrants in need of humanitarian and legal support with neither, thereby exacerbating human suffering at the border. Since last year, NLG lawyers, legal workers, and law students have been on the ground in Tijuana volunteering legal support, training, and observation in coordination with other organizations such as Al Otro Lado. The NLG urges deepened investigation into this report and demands an immediate termination of the illegal practice of targeting activists and journalists. The National Lawyers Guild, whose membership includes lawyers, legal workers, jailhouse lawyers, and law students, was formed in 1937 as the United States’ first racially-integrated bar association to advocate for the protection of constitutional, human and civil rights. The US government is detaining more than 13,000 migrant children, the highest number ever; as of last month, some 250 “tender age” children aged twelve or under had not yet been reunited with their parents. Recently, the president has vowed to “put tents up all over the place” for migrants. This generation will be remembered for having allowed concentration camps for children to be built in “the land of the free and the home of the brave.” This is happening here and now, but not in our names. With fingerprint unlocking and now facial recognition as a mechanism for securing your mobile phone, phone security against loss and theft has increased markedly. But, these fingerprints and facial recognition provide little to no protection against law enforcement. Essentially, because your face and your fingerprint are public -- visible to everyone -- you have no right in the law it seems to keep devices secure through these mechanisms. Law enforcement and even customs officials, however, have limited authority to order you to open your mobile devices via a pass code. The trick is how to de-activate your fingerprint or facial recognition ID quickly. On iPhones and iPads, one way is with this voice command: "Hey Siri, whose iPhone is this?" (you need to say iPhone even when speaking to an iPad). The mobile device will now require a pass code to unlock. April 31, 2018 -- Early this morning, Immigration and Customs Enforcement (ICE) came to pick up one of Freedom, Inc.'s longtime members, a Khmer man named Sophal Chuk. Sophal is 67 years old, does not speak English, and has a knee injury that needs medical attention. He is currently being detained in Milwaukee, and will potentially be deported to Cambodia. Sophal's family is very concerned about his safety and well-being, and they are not allowed to visit him until Monday. Today is the first day of Khmer New Year, and instead of spending the weekend with his family as he had planned, he is now spending it in a jail cell. Like all members of our Madison Khmer community, he does not deserve this treatment! We are working with Southeast Asian advocates to communicate with Sophal and gather information, and will keep sharing updates when we can. This unjust detention is the direct result of President Trump's aggressively anti-immigrant agenda, which has led to the rounding up, detention, and deportation of hundreds of Southeast Asian refugees. Just last week, 43 Cambodian Americans were deported, joining a group of hundreds of refugees who came to the US to escape the genocidal Khmer Rouge regime in Cambodia and are now being torn away from their families and homes. We need to work together to oppose these inhumane actions and protect our Southeast Asian families in the U.S. If you have a deportation order, do NOT open the door for ICE. They may claim to be the police or have a warrant, but they are lying. If you get an unscheduled check-in appointment, expect to be detained. Please call Advancing Justice ALC at (415) 896-1701 if you know of Khmer Americans being picked up by ICE, or if you have an ICE check-in. They will help assess the case and assist families in planning for the possibility of detention. New online resource--youthinfront.org--advice on leading change from experienced youth activists and allies. All around the country, inspired by activists from Ferguson to Parkland, a generation of young people are considering participating in their first political action or protest. They have questions. What’s the point of a walkout? Will I get in trouble? What happens after a march? YouthInFront is a community-created online learning resource. We started by interviewing and surveying youth about their questions, and then sourced questions from adult allies and educators as well. We believed the best people to answer those questions are experienced youth activists and allies. During an 18 day sprint from Feb 13 to March 7, we interviewed nearly 30 youth activists and educators, reviewed youth-produced and youth-focused resources from around the web, and benefitted from the generous contributions of media producers, civic educators, youth activists and organizers, software engineers, and many others. The YouthInFront community is made up of individuals with diverse array of beliefs about public policy, the tactics and strategy of protest, and how adults can best and most appropriately support students. What we all agree on, though, is that youth-led civic activism can transform society for the better. Young people are powerful civic actors, and during their apprenticeship of citizenship, their voices deserve to be heard. The youth in our community are leaders; the adults in our community are supporting them as they march up front. YouthInFront was kicked off by three longtime civic educators: Justin Reich from MIT, Doug Pietrzak from Fresh Cognate, and Meira Levinson from the Harvard Graduate School of Education (HGSE). Yes, this means that YouthInFront site was planned and organized by adults – but we hope that we have used the wealth of resources at our disposal to provide a model of how adults can support youth who are leading the way. We quickly had nearly 100 volunteers from Cambridge, Boston, and across the country, and we gratefully acknowledge their many contributions. YouthInFront is supported by a wide variety of organizations, led by the Harvard Graduate School of Education Usable Knowledge project, the MIT Teaching Systems Lab, Fresh Cognate, Justice in Schools, and the HGSE Teaching and Learning Lab. A wide variety of other organizations sent resources, offered suggestions, and shared our site within their networks. We gratefully acknowledge these informal partners below. The majority of project resources were generously provided by volunteers; we also gratefully acknowledge financial support from the HGSE Dean’s Office and Dean James Ryan. Please send questions, comments, and feedback to youthinfront@mit.edu. Apologies if we cannot respond to all queries. More than 200 folks are facing very serious charges and jail time when they were mass-arrested during public protests at the Trump inauguration. For instance, prosecutors are using Facebook "likes" of the disruptj20 website as evidence of an intent to commit violent protest. NLG's communications director, Tasha Moro, has an excellent update on the trial in this case and how it intersects with new surveillance initiatives against protests on the left, including Black Lives Matters. On November 8th, 14 year old Jason Pero was shot and killed by an Ashland County Deputy in front of his home in Odanah Wisconsin on the Bad River reservation. Neighbors and relatives challenge the official story put out by the Wisconsin Dept. of Justice, and their videos contradict the officer's claim that he was in danger from a middle school kid with a knife. The Bad River tribe has demanded a federal investigation. Come bring lights, drums, and songs to remember this young singer, drummer, and keeper of his Anishinabe peoples' traditions. 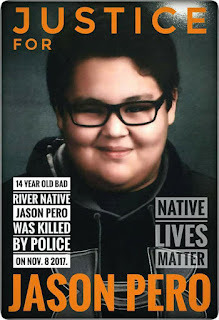 Demand justice for him and protection for indigenous people across the world as we close out Native American Heritage month in the U.S.A. Our heritage should no longer excuse violence against our indigenous relatives. We will begin at Wisconsin DOJ's office on West Main Street and proceed to the US Attorney's office on West Washington Avenue. Please come and invite your friends. Madison NLG is the local chapter of the National Lawyers Guild. Contact us via e-mail at madisonnlg@gmail.com or by phone at 608-520-0654. The chapter can provide legal observers at an event. Contact the chapter for further information.